Tell me: if the hidden treasure is now on display at the bazaar, shouldn't the gnostic leave his cell and wander forth! The other day I was volunteering to teach 'how to use the internet' to few person (young and senior) in a non-government development organization that works for underprivileged children and vulnerable women. They have never used internet themselves, have almost no idea about what internet is, how it works and what usage it may have for them. While sitting with the eager minds to know and learn about this modern day miracle, back of my mind I was pondering about how to start to tell what internet is, how it works (they didnt have technical vocabulary to understand what a server or internet service provider exactly is). To introduce a new concept, a new name and a new form in someone's consciousness is such an interesting process because one has to find the right language and parables! Of course I had to use as down-to-earth examples as possible to describe the essential technicalities of it, and began by telling and showing them how an internet address, an email address look like. Also introduced the undeniable google.com search engine to find virtually any information about anything they can imagine. While explaining the way instant communication works across the globe works through the internet, I mentioned about the fact that with internet people have crossed the boundaries of time and space. One can send an email from Bangladesh and the other person on the other side of the world can receive it almost instantly, the space and time is immaterial in the face of the power of internet. Not to mention, this was such a wonder for them! Those of us who have been fortunate enough to use internet just like anything, we often take for granted what this technology and its new possibilities offers. The internet is one of the most significant technological developments of the present time. Through the World Wide Web humanity has been given a tool for global communication and inter-connectivity. Its use has become central to the lives of millions of people, businesses and organizations, linking humanity together in ways unimaginable a few decades ago. But how does it relate to the emerging consciousness of oneness? Contemporary mystic and sufi teacher Llewellyn Vaughan-Lee have been speaking and writing about the internet and its being a symbol of global oneness for sometime now. I share some it here. We are so immersed in the many distractions of today’s culture that we do not notice the symbolic dimension of the new images that life is giving us, and so we are unaware of their primal power… When we think of the Internet, for example, we see only a tool for communication or commerce. We do not see that it is a living expression of a new consciousness that has within it access to energies and powers that can completely rearrange our world. If we were awaken to its real symbolic potential, we would be truly in awe - and we would laugh, with wonder, at life’s capacity to recreate itself while we are not even looking. The Internet is a powerful, living image of life’s oneness. As it becomes more and more present in our collective consciousness, it is more and more able to channel life’s underlying energies in new ways. It is a power and life force of its own, able to evolve and adapt like a fast-changing organism, and, like other emerging images of our time, it is reconfiguring our consciousness, helping us to interact with life in new ways. Like all symbols, the Internet will reveal the secret of its real potential only if we approach it with the right attitude and acknowledge its sacred dimension. At the same time, working with these emerging images requires a different attitude from the one we bring to symbols that relate only to the inner or spiritual dimension. In our Western culture we tend to see symbols as separate from everyday life, usually relegating them to sacred or religious ceremonies. It is many centuries since we have related to the ordinary activities of our daily life as having a symbolic dimension. And what could be more “mundane,” more of our everyday world, than the Internet? To access the symbolic within the mundane requires that we lose that “spiritual” conditioning and free ourselves from its restrictions. "Arianna's recent comments about Jeremy Rifkin's The Empathic Civilization, and in particular his reference to global communication, "Seven billion individual connections, absent any overall unifying purpose, seem a colossal waste of human energy," prompts me to write about my own experience of the unifying purpose and potential of the Internet, of this increasing connectivity. I remember when I first accessed the Internet in the early Nineties. I think that my children were using AOL and I went online to see what these "chat rooms" were. But although there was not much content in those days, I was struck by its potential and possibility. At that time I was having mystical experiences of the oneness that is present in all of life. In these moments I was made aware of the interconnectedness of all of creation, and how everything is a living expression of divine oneness. This first time that I went online I saw in that moment how the Internet could give the whole of humanity direct access to this interconnectedness and global oneness. All that is required is a computer and a connection. Almost twenty years later the Internet is one of the central tools of our global connectivity. In the last few years it has radically changed our culture, how we communicate and access information. From laptops and cybercafes all around the world, even in unexpectedly remote locations, we are forming an interconnected whole, a network of human consciousness. And yet, although we are more and more immersed in this new form of communication, we do not appear to realize its deeper significance. There is the danger, that, as in the words of T.S. Eliot, we "have the experience but miss the meaning." I believe that the Internet is a gift we have been given. It provides an image of how the energy of life can flow freely in a way that defies the barriers of nationality and geography. Yet sadly because we are so immersed in the surface activity of this technology, in its tools of commerce and communication, we do not realize its deeper, symbolic dimension. A symbol is a connection to the sacred ground of our being which alone gives real meaning to our daily life. The Internet, as a living symbol of global oneness, offers us a direct connection to an awareness of divine oneness. But because we have lost touch with the symbolic dimension of life, we do not fully recognize this potential of the Internet: as a dynamic expression of a new consciousness of oneness that has within it access to energies and means that can unify our divisive world. If we were awaken to its real potential, we would be truly in awe--and we would laugh, with wonder, at life's capacity to recreate itself while we are not even looking. The Internet is a powerful image of life's interconnected oneness, and how the individual can interact with the whole. It is present everywhere at the same time. The Internet is not a hierarchical structure, and despite the attempts of some companies or governments to control it, it's nature is globally democratic. As it becomes more and more present in our collective consciousness, it is more and more able to channel life's underlying energies in new ways. It is a power and life force of its own, able to evolve and adapt like a fast-changing organism, and, like other emerging images of our time, it is reconfiguring our consciousness, rearranging our lives. For example, social networking is just one way this living web interacts with us, bringing us together in unexpected ways. In the Internet we have been given a blueprint for the future whose full potential we have not yet grasped because we see it with the eyes of the past. The Internet is a direct expression of the emerging energy structure of the planet in which the need of the individual can be met within the organic evolution of the whole, and the evolution of the whole served through the free participation of each individual. 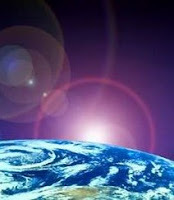 How much more we would benefit if each time we access the web we are consciously aware that we are connecting to a field of global consciousness. That was my first experience of the Internet, and each time I open my computer I feel this potential, this new quality of consciousness that is waiting to be lived. We need to be awake to the real potential and purpose of the Internet: what it really means for humanity as a whole to be given this degree of interconnectivity. At the present time it is primarily used (and at times misused) for accessing information and communication. But it has the potential to create patterns of interrelationship that will form the network for a global consciousness and unity. The real potential of the Internet belongs to this new flow of consciousness throughout the planet. The expanding web of individual connections is like a cellular structure that is continually making new connections. Through this worldwide web the world and humanity can organically come alive in a new way. And we can midwife this new awareness and its possibilities: the dynamic oneness that belongs to life. Or we can just watch the images and text on our screens, not knowing the opportunity that we have missed, unaware of the "overall unifying purpose " of why we are so connected." I personally think that global communication and the Internet are among the signs of the world waiting to transform, waiting to shift into a different level of consciousness.